Harmony Healthcare International (HHI) recommends the review of this report on a regular basis to identify potential MDS coding, compliance or submission concerns. Changes in resident identifiers may potentially create a second Resident Internal ID Number in the system. The following information is provided to assist in determining the correct steps in modifying the MDS, based on the issue. When a submitted record is accepted into the National database, the system compares the resident-identifying information contained in the submitted record to corresponding information in the existing resident records in the Resident table. Based upon specific criteria listed below, this process determines if the resident is a new resident or one for whom a resident record already exists. If the resident-identifying information submitted in the record is sufficiently similar to the resident information in an existing resident record, a match occurs and the submitted record is associated with the existing resident record. If the resident-identifying information in the submitted record is not sufficiently similar to an existing resident record, a new resident record is created in the Resident table and the submitted record is associated with that new resident record. The criteria used for the Resident Match process are grouped into sets. 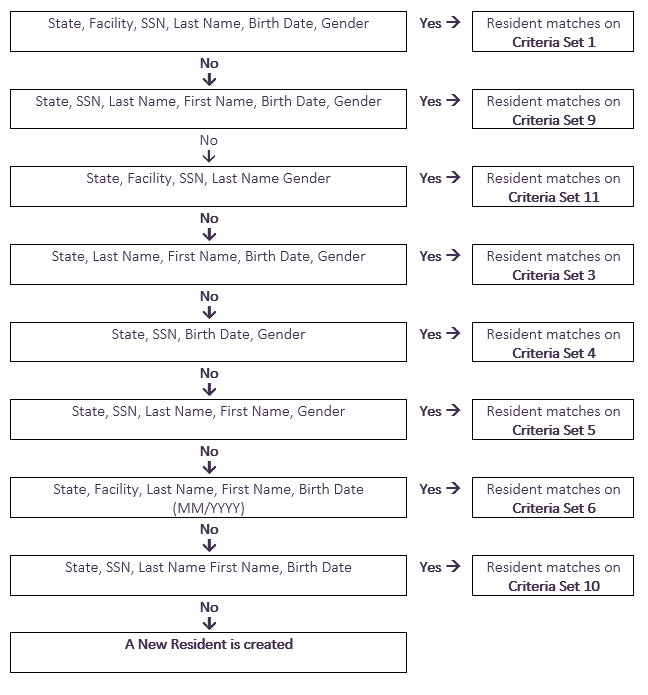 Using these criteria sets, the Resident Match process compares the resident information in each submitted record to the existing information in the resident records in the Resident table in the order shown in the table below. When a match occurs, the Criteria Set ID of the criteria set that determined the match is stored in the resident_match_criteria column of the accepted submitted record for future reference. (such as twins with the same first name, but different middle names), enter at least one of the resident’s middle name into the First Name field (along with the first name) to make the first names unique. This ensures that unique records for both residents exist in the Resident table. If identical names are entered in the First Name field for both residents and SSN are not entered, the system considers them the same resident and associates all the submitted records for both residents with that one resident record. This may cause some submitted records to receive warnings or be rejected. and an Existing Resident Record? If more than one of the resident-identifying criteria fields differ in a submitted modification record and its corresponding resident record, the action taken may vary depending on the system to which the record was submitted. For MDS if a new resident record is determined to be needed, it will be added to the resident table and the replacement record associated with the new resident. Depending upon the situation, this may or may not be the desired outcome. When you must modify multiple resident-identifying fields in a previously accepted record, refer to the flowchart provided. It will assist you in determining if you can submit all the necessary resident identifier changes in one modification. Compare the values of the resident-identifying fields (First Name, Last Name, SSN, Birth Date and Gender) in the modification record to those in the previously accepted record it is correcting. You may need to complete and submit multiple modifications to a record to ensure that a new resident record is not created. If the flow chart states that “A NEW resident is created”, the changes require multiple modifications to the record, if you do not wish to create a new resident record. For each modification, check the flowchart to determine the outcome of the change you are planning to make. Based upon the flowchart provided and if you are not changing the State or Facility Internal ID, the following rules govern whether a new resident record is created when you submit a record modification with differing resident identifiers. If Gender is not available, you may not update any other resident-identifying field without creating a new resident record. If SSN is not available, you may only update the Birth Date Day without creating a new resident record only if all other resident-identifying fields, including birth month and birth year, are present and matching. If Birth Date (month, day and year) is not available, you may only update the First Name without creating a new resident record only if all other resident-identifying fields are present and matching. If Birth Date – day of month only is not available (birth month and year must be present and matching), you may only update the SSN without creating a new resident record only if all other resident-identifying fields are present and matching. If First Name is not available, you may only update either the Birth Date or Last Name without creating a new resident record only if all other resident-identifying fields are present and matching. If you update both the Birth Date and Last name, a new resident will be created.